to do drills and maintain your base skills. The name of the game here is patience and Ibuprofen. It is recommended that you use an instructor to help you get going and to give you a better idea of where to put your time and energy in the beginner stage. This will better your chances and potential for a good time and rapid snowboard skills foundation advancement. However, you will take some hard falls. the nature of 2 feet on one board with sharp edges is that while you are learning you will catch an edge or 3. When that happens the resulting whip and smack can hurt a bit. Don't give up!! Keep trying and for every little moment of success or fun along the way, enjoy it and give it credit, for the pleasure is just beginning. Yes, snowboarding is incredibly fun. It is great how once you get through the first couple days and finally figure out how to turn left and right and stop, you will start to progress fairly rapidly. Then all the way through your learning curve, the better you get the more fun it is. This is a nice feature of the sport. 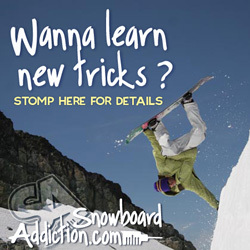 Whether you are able to use an instructor or not, here are a few drills you can do on your own time to make sure that you are setting a good base for your snowboard skills foundation. In this snowboard skills foundation drill we will focus on edge control and finding your mid-range comfort zone. This seems incredible basic but it actually requires a lot of practice to do it easily. First find a moderate slope and get strapped in. On your heel edge, stand up holding your edge into the hill to prevent sliding. Now, from this position, reach down the hill with your hands and slowly shift your weight away from the hill to allow the heel edge to release and begin sideslipping downhill. If you immediatly start to drift one way or the other, you are most likely out of alignment or standing more heavily on one foot than the other. Adjust as you go and find the middle ground to control a smooth straight forward sideslip. Maintain the mid-range body position and slide stright down the fall line for 10 or 20 feet. Next start to shift your weight back towards your heel edge and into the hill to slow the slide down and return to a stop. Relax and use subtlety of movement and finesse to return to the motionless mid-range position that began the sequence. Use the rest of the slope to repeat the steps above. Sideslip, Stop, Sideslip Stop. Practice the position and feel what works and what does not. Nice job!! As, with the heelside drill, find a moderate slope and get strapped in. On your toe edge this time, stand up holding your edge into the hill to prevent sliding. With your shoulders straight in line and paralel with the board and your chest up, settle into a mid-range postition and try to stand motionless on the hillside. Your arms should be relaxed, elbows out and hands out over your toes. Move around slowly and try and find the most comfortable body position the will allow you to just stand there. Flex down into your mid-range and search for control. Now, from this position, slowly shift your weight away from the hill to allow the toe edge to release and begin sideslipping downhill. If you immediatly start to drift one way or the other, you are most likely out of alignment or standing more heavily on one foot than the other. Adjust as you go and find the middle ground to control a smooth straight backwards sideslip. Next start to shift your weight back towards your toe edge and into the hill to slow the slide down and return to a stop. Relax and use subtlety of movement and finesse to return to the motionless mid-range position that began the sequence. Another great beginner drill to help find and develop board control comfort level is the falling leaf. The falling leaf drill is called that because it mimics the action of a leaf falling from a tree that gracefully drifts side to side. The leaf makes an arc as the air resists is fall by supporting the weight of the leaf. The leaf will drift to one side arc up and stall out before switching directions and drifting in the same kind of arc in the opposite direction. Start by finding a moderate groomed slope and get strapped into your board. Start on your heelside and stand up holding your edge into the hill to just stand steady with your board across the fall-line. Squat down into your midrange position and get ready to slide. As you shift your weight forward away from the heel edge, allow the board to begin sliding sideways down the hill. Maintaining the midrange stance, slightly rotate your upper body and hips towards the tip of the board. To the right if you’re Goofy Foot, or to the left if you’re Regular Foot. You will continue side-slipping as you begin drifting in that direction. After sliding 10-20 feet in that sideways direction, square your shoulder to the board and shift your weight back over the heel edge to arrest the slide and stall out in a brief momentum pause. Now, slightly rotate your upper body and hips in the opposite direction and allow the board to start sliding the other way. Maintain position and control as you drift across the hill. After side-slipping sideways for 20-30 feet, again square your shoulders to the board and shift weight over the heel edge to again arrest the sideways slide and arrest the drift. Continue the side to side drifting, and find a nice rhythm that feel comfortable and just be aware of how your body position, shoulders, hips, knees and weight over the feet effect the control of the board as you continue the Falling Leaf movement. Nice job. Practice…. This time on your toe edge, stand up holding your edge into the hill to just stand steady with your board across the fall-line. Squat down into your midrange position and get ready to slide. Shifting your weight backwards away from the toe edge, allow the board to begin sliding sideways down the hill. Maintaining the midrange stance, slightly rotate your upper body and hips towards the tip of the board. To the right if you’re Goofy Foot, or to the left if you’re Regular Foot. You will continue side-slipping as you drift in that direction. After sliding 10-20 feet in that sideways direction, square your shoulder to the board and shift your weight back over the toe edge to arrest the slide and stall out in a brief momentum pause. After side-slipping sideways for 20-30 feet, again square your shoulders to the board and shift weight over the toe edge to again arrest the sideways slide and pause the drift. Okay, this one is fun. Here we will learn how to use your arms upper body and hips to lead rotation of the board and body of the rider. It is also a great exercise to get used to sliding and rotating from edge to edge, heels and toes. This will end up being great practice for later on when you are learning to spin off of jumps. You want to be capable of over or under rotating and landing on the uphill edge to slide out of it. If you end up landing on or catching your downhill edge upon landing or sliding out, the resulting whiplash crash will be dangerous and painful. It is good to be comfortable with the Side Slip drill and the Falling Leaf before attempting the Pinwheel. This time find a smooth groomed hill that is not as steep, maybe even on the flatter side of things. Get strapped in and get ready to spook yourself a bit. Okay, stand up on either edge, hold you spot on the hill and once again, squat down into the midrange position that we will continue to work from throughout this site. Release the edge and start sliding slowly downhill. Here comes the moment of truth. Wind up your upper body one way or the other, gather yourself and unwind with a smooth powerful movement. Keep your head and upper body leading and your hips, knees and lower body following while you switch from edge to edge rotating down the hill. -In this drill, while rotating left or right, for a brief moment your board will point straight down hill and want to take off, but you will keep driving the rotation with your upper body and switch from edge to edge while you twirl down the hill like a pinwheel. Take note of which direction you instinctively tried first. Chances are this is your more natural way to spin. All people have a more natural direction to spin. It is important to make use of that awareness both in the effort to push your progression and to continue working on the weaknesses and cracks in your basic skills foundation. Now, go back up and try it the other direction. Have Fun and keep at it. If it's hard, it's worth it. Riding catwalks can be very difficult for beginners. That being said, It can also be an outstanding place to check your snowboard skills foundation through body positioning and board control skills. When on a catwalk, or other flat terrain you will feel the board kind of floating around under you. This makes it feel likely that you may catch edges, which is scary. Try to overcome the fear and experiment with your alignment and stance to try and find the comfort zone. This can really be valuable as a learning tool. Again it is challenging to face the fear and work on something so basic, that seems so difficult. But the outcome of accepting the value of it is in itself good practice for high level progression. Also, it is nice to not feel terrified by the high edge catching potential of a flat catwalk. One more very important thing to practice on the subject of snowboard skills foundation is developing your habit of making good round turns. It is normal for many beginners to make turns that leave kind of a zig zag track in the snow. This is okay to start but as soon as you are comfortable enough you should try hard to finish the turn by riding the shape of the board furter through the turn and across the hill. This more complete type of turn will leave more of an S shaped track and is a basic skills foundation goal. Work towards smooth round S shaped turns that are led by the upper body. In conclusion for the snowboard skills foundation page, I should point out that these drills and practices apply all the way through the highest level of riding. Don't hesitate to pull these drills out once in a while to hone your skill set and continue to build that foundation. Again, I must encourage the value of work hard and determination. If its challenging, its worth mastering.